"To be different. To be powerful. Is that not a divine gift?" Includes the devilish immortal’s drink of choice! Entertainment Earth Convention Exclusive! Money, beauty and eternal youth. Dorian Gray truly is a triple threat kind of guy that has it all. Now collectors can have him with the Penny Dreadful Dorian Gray 6-Inch Action Figure from Bif Bang Pow!. The expertly detailed figure showcases the reckless risk-taker in a sophisticated black tailcoat suit made of soft and bendable PVC plastic. The rest of Dorian Gray’s ensemble is completed by a white button shirt and a striped magenta vest. 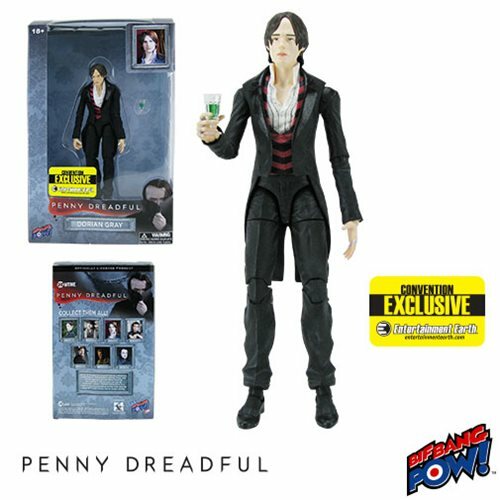 This first ever 6-inch figure of the popular Penny Dreadful character features a whopping 18 points of articulation and includes Dorian’s signature goblet as an accessory. With a production run of only 3,700 pieces, this individually numbered and limited edition Entertainment Earth convention exclusive will disappear scary fast! Ages 18 and up.